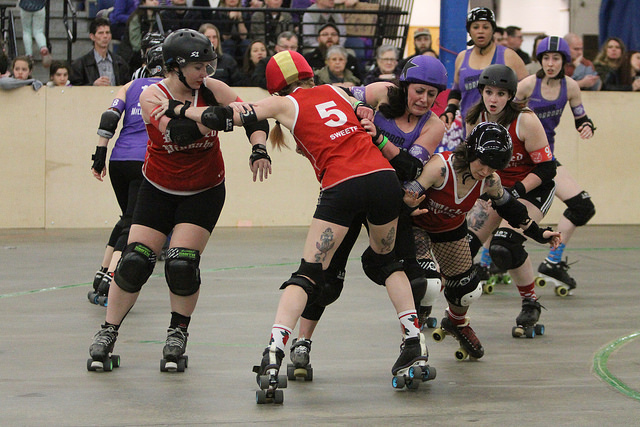 April 15th marked the end of Boston Roller Derby Home Teams regular season as teams begin the road to playoffs. A packed Shriner’s Auditorium cheered all four home teams during one of the most exciting nights of the season. Join us on May 5 at Simoni Ice Rink in Cambridge, MA for Home Team Playoffs. Tickets on sale now! The Wicked Pissahs were victorious over the Harbor Horrors, final score 242-194. The Cosmonaughties eeked out a win in the last jam over the Nutcrackers, final score 224-222.